Microsoft Nigeria in partnership with Andela is introducing the Andela Learning Community powered by Microsoft. Are you passionate and looking to start or level up in a programming career in DevOps or Front-end Development here is an opportunity to. Microsoft Nigeria is joining Andela’s Learning community with these two offers. The Andela Learning Community(ALC) powered by Microsoft aims to support technology enthusiasts to become world-class developers and IT professionals using Microsoft technologies (MCPs). This collaboration synchronizes with Andela’s mission to support the creation of thousands of African technologists and technology leaders. Here’s another opportunity to either kick-start your programming journey or Level up your experience. The tracks are open at Beginner/Intermediate and Advanced levels. It doesn’t matter your level of programming skills , you can apply. The application is open to Nigerians only, as this is by the Microsoft Nigeria and Andela Nigeria offices. With Andela and Microsoft offices in Kenya maybe this offer will too soon. 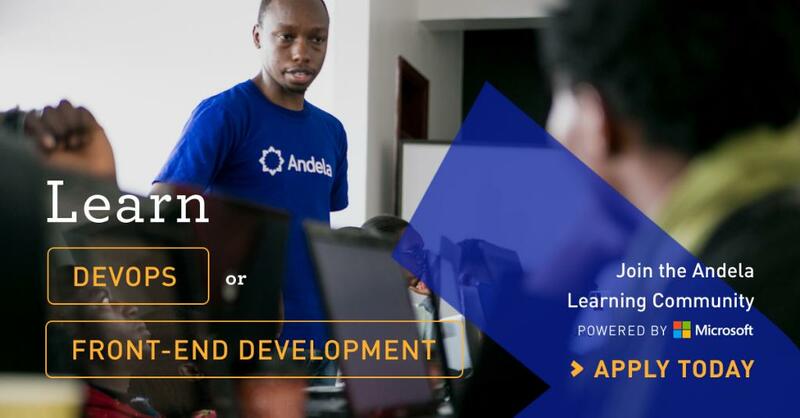 To participate, register for an opportunity to be a member of the Andela Learning Community powered by Microsoft. I think is a good place were one can have more experience and learn more about technology am willing to put my effort in oder to make our visions come through,Thank you.